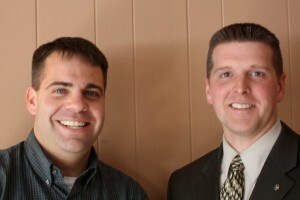 FULTON, NY – Zach Menter introduced Dennis Goss, one of four funeral directors at Foster’s Funeral Home in Fulton and Hannibal at a recent Fulton Noon Rotary Club meeting. Dennis discussed the wisdom of preplanning your funeral arrangements. If a person records the how, what, when, and where, of their life events, and writes down their wishes for their funeral services and burial, it makes it much easier on the funeral director and the family to carry out your plan. Dennis urged the Rotarians to fill out an “Individual Estate Record,” available from most funeral homes, to organize your plans for your family. Incidentally, Zach is a member of the Fulton Rotary Club and Dennis is a member of the Fulton Sunrise Rotary Club. Contact either one to learn more about the world’s oldest service club, Rotary International.